Which ultimately is a shame, as I found it to be rather an enjoyable film and somewhat perversely, the authorship question is just one of many strands of story in what turns out to be a historical political thriller, mainly based around the succession to the throne as Elizabeth I’s reign has produced no (legitimate) heirs. That one of the key players in her court just happens to be a playwright on the sly, who is forced to use a surrogate by the name of William to get his plays staged, is taken as a given here and it makes for an entertaining ‘what if’ scenario. I am aware that one of the best ways to rile people is to tell them to chill, but man, you guys shouldn’t take it all so seriously 😉 There’s lots of fun to be had in here, honest. The film really is awash with great theatrical spots: some are ‘blink and miss ’em’, like Henry Lloyd Hughes’ bear baiter and Jasper Britton’s Pope, others are a bit more sustained like Trystan Gravelle’s Christopher Marlowe and James Clyde’s James I. The cumulative effect really is one of rather good quality, which may surprise anyone who has seen any of Emmerich’s previous films! With Vanessa Redgrave and Joely Richardson playing Elizabeth I at different ages pulled between friend and foe yet a canny negotiator and flaming strumpet with it, Mark Rylance declaiming (rather predictably) on the Globe stage as an actor and Derek Jacobi as a bizarre modern-day narrator (recalling his turn in Branagh’s Henry V if anything), the casting could even be considered heavyweight. And they’ve largely got it spot on here. David Thewlis and Edward Hogg glower brilliantly as Cecils older and younger, Sebastian Armesto (last seen naked on the NT stage) makes an appealing Ben Jonson and Rafe Spall’s raffish, illiterate Shakespeare is rather good fun. And at the centre of it all, Rhys Ifans gives an excellent performance as the Earl of Oxford, a man caught in the wrong place at the wrong time, whose position as a courtier embroiled in dynastic struggles around the succession means he can never reveal himself as the true playwright that he is. The scenes as he watches his plays being rapturously received at the Globe whilst someone else takes the credit for them are heartbreaking, his battles against the scheming Cecils are powerfully fought, he makes for a great protagonist. People who know me will see the deep irony in me making allowances for a film which bends historical events to its whim (in a tribute to Shakespeare’s own rewriting of history, as a rather witty explanation put it) – I’ve had countless pub debates about how much I hate it when films do that, the ending of Braveheart being the one which annoys me most. 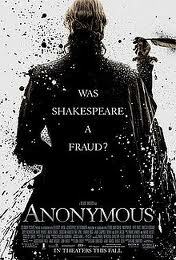 But somehow Anonymous rather won me over: maybe it was the low expectations, maybe it was partly the determination to swim against the tide, maybe it was just the number of people I’ve seen on the stage before, or maybe it’s not that bad a film!